The following obligations apply to all passengers using Ghana’s air and sea ports as well as land borders. Passengers should not enter or disembark from ships, aircraft vehicles without permission from Customs. All passengers must go by the most direct route to the Customs examination area and produce all baggage. They should make written or oral declarations of goods and baggage imported by them to Customs. During examination, documents called for are to be produced for scrutiny and all questions relating to goods must be answered. The Passengers’ Unaccompanied Baggage Declaration (PUBD) Form must be completed to account for part of one’s baggage, which has arrived in advance or left behind to arrive in another aircraft, ship, vehicle, or by post. All Arms and Ammunition must be declared to Customs. Foreign currency may be declared on BOG Foreign Exchange Declaration Form (FXD Form 4A) which can be downloaded from the Bank of Ghana website: www.bog.gov.gh. Wearing apparel and personal effects. Binoculars, sports requisites, toys and articles for household use (such as perambulators, pictures, glassware, linen, cutlery, crockery and plates which are shown to have been in the passenger’s personal or household use for a reasonable period. Photographic films, plates and sound recording tape but not including such materials if imported for the purpose of commercial photography or sound recording. Instruments and tools for the personal use of the passenger in his profession or trade but NOT INCLUDING arms and ammunition, motor vehicles fabrics in the piece, provisions, stationery, portable or perfumed spirits, tobacco goods, wine, saddlery or any goods imported for the purposes of trade. The items involved must be for the use for the passenger concerned and NOT for sale or intended for other persons. In the case of electrical goods, these should gave been in the bona fide use of the passenger for at least six (6) months to qualify for the concession. 37.5 centiliters (375ml) of potable and perfumed spirits. Wine not exceeding 75 centiliters (750ml). Cigarettes, cheroots, cigars, tobacco and snuff, not exceeding in all, one pound i.e. 0.5kg in weight. Items in excess of the above will be subject to duties and taxes. Failure to produce such articles for examination will render them liable to forfeiture or penalty. Passengers who have sent their personal effects in advance or are expecting personal effects after arrival must declare these on the appropriate form known as the “Passengers Unaccompanied Baggage Declaration” Form. This declaration must be made immediately on arrival or within forty-eight (48) hours of arrival. 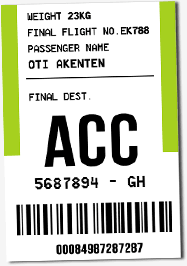 If a passenger fails to so declare, he may forfeit the concession. On arrival at the Airport from abroad, the following channels are available for travelers. A passenger may use the channel if he/she is sure to be carrying goods which are free of duty and are allowable under the passenger baggage concessions. Ghanaians who have stayed outside Ghana for more then twelve (12) continuous months and are removing residence may import their removal articles free of taxes. Removal articles include movable personal belongings or effects, domestic appliances, household provisions normally kept in stock, collectors’ pieces, pet animals, and also any equipment (other than agriculture, commercial or Industrial plant) necessary for the exercise of the calling, trade or professions of the passenger. Removal articles do not include arms, ammunition and motor vehicles. Arms and ammunition are restricted items, and can only be imported on a special permit. These may be imported without payment of duties and taxes. Evidence of death must be produced to support application for concession. All imported goods apart from the baggage concessions and those for specified government, privileged persons, organizations and institutions attract import duty and other taxes. Different rates of import duty as well as different types of taxes may be applicable depending on the category of item. There are restrictions on the physical conveyance of currency to and from Ghana. Residents and non residents travelling abroad are permitted to carry up to US$10,000 or its equivalent in travelers cheque or any other monetary instrument. Residents and non-residents arriving in Ghana are similarly permitted to carry up to US$10,000 or its equivalent in travelers cheque or any other monetary instrument. Amounts in excess of US$10,000 or its equivalent shall NOT be carried in cash of any form of currency or monetary instrument by a traveler whether resident or non resident. Amounts in excess of US$10,000 or other foreign currency equivalent shall be transferred only through a bank or authorized dealer. Where the amount does not exceed the US$10,000 limit or its equivalent in any other currency the traveler is required to declare the amount to Customs and proceed to fill the BOG Foreign Exchange Declaration Form (FXDF) at the port of entry or departure. Where the amount exceeds the limit of US$10,000, Customs shall seize the entire amount whether declared or not. Knuckle dusters, and life preservers: Knuckle dusters and life preservers. Explosives, including nitroglycerine, dynamite, detonators, gun cotton blasting powder, other substances used to produce explosives but excluding ordinary gun powder, percussion caps, rockets or fuses: A Ministry of Interior license is required. Handcuffs: A Ministry of Interior license is required. Milk deficient in milk fat: Milk, condensed or evaporated, containing less than eight per centum by weight of milk fat, and dried milk or milk powder containing less than twenty-six per centum by weight of milk fat. Nets and traps for animals: Nets, gins, traps snares, spring-guns, missiles containing explosives, apparatus for setting guns and all similar or other mechanical engines or appliances including any parts thereof or accessories thereto designed, calculated or intended to be used or capable of being used to capture, injure or destroy an animal. Paper, airmail printing: Airmail photographic printing paper, except under license of the Commissioner. Press rotary ticket printing: Reel-fed rotary ticket printing presses, except under license of the Minister for Finance and Economic Planning. - Spirits containing essential oils or chemical products such as thujone, star arise, benzoic aldehyde, salicylic esters, hyssop, absinthe or other substances in such proportions as the Commissioner in his absolute discretion deem to be injurious to health. - Brandy, rum or whisky unless provide to the satisfaction of the Commissioner to have been stores in the wood for a period of not less than three years prior to importation. - Spirits containing more than 65 per centum of absolute alcohol as ascertained by Tralles` alcoholmeter other than medicated, perfumed or methylated spirits, accepted as such by the Commissioner, except under license from the Commissioner and except in accordance with the condition of such license. Weapons for discharge of noxious liquids: Weapons of any description which in the opinion of the Commissioner are designed for the discharge of any noxious liquids, gas or other similar substances and any ammunition containing or in the opinion of the Commissioner designed or adapted to contain any noxious liquid, gas or other similar substance, except under license of the Minister for Interior. Mercury: A license is required from the Ministry of Mines and Energy (Mercury Act, 1989, PNDCL 217).